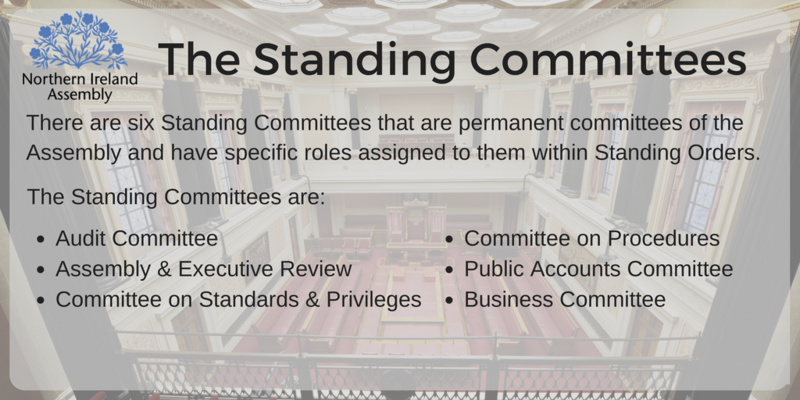 Assembly Round Up: The Public Accounts Committee - What does it do and how does it work? The Public Accounts Committee - What does it do and how does it work? What is the purpose of the Committee? The Assembly’s Public Accounts Committee is responsible for carrying out inquiries into Government Department and non-Departmental spending to ensure that the Northern Ireland public are receiving value for money. The Committee takes briefings from Ministers, their officials, and other stakeholders as part of their inquiries. 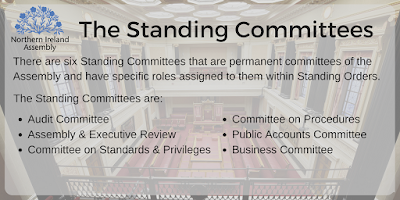 The Public Accounts Committee, which is a Standing Committee , has the widest remit of all Assembly Committees as it scrutinises the way Government implements its policies, strategies and programmes. The results of these inquiries are presented to the Assembly and to the Department involved. The Committee makes recommendations to the Departments to ensure that lessons are learned and change is implemented. The Committee holds regular meetings on Wednesdays, at 2.00pm in the Senate Chamber in Parliament Buildings during the Assembly session, which members of the public are welcome to attend. Some of the areas that the Committee has carried out inquiries on are: Northern Ireland Events Company, governance of land and property in the NI Housing Executive, Sustainability of Schools, advanced land purchases in the Department of Social Development, effectiveness of public transport, NI Courts and Tribunals Service, management of capital projects in the Department of Culture, Arts and Leisure, the criminal legal aid system. If you want to get involved with the work of the Committee, you can see what inquires the Committee is currently carrying out on their Committee page and read the Minutes of the meetings, as well as any Minutes of Evidence Sessions. You may also request to give evidence, if you or your organisation is affected by the issues that the Committee is discussing, including Bill inquiries by contacting the Clerk of the Committee. You can also watch the Committee meetings on the live stream on the Assembly’s website and access the ‘Watch/Listen Again’ the day after the meeting. Alternatively, you might wish to contact Members of the Committee directly; you can find their details on the Committee’s page or on the Your MLAs page on the Assembly’s website.